Einstein once said that any idea “should be as simple as possible—and no more.” He realized that simplicity was a good thing, but like any good thing, there can sometimes be too much of it. The same advice applies to the trend of microlearning. The slogan behind micro-learning endeavors are “shorter is better.” This is true, to a certain extent. Some vendors and educators are taking this to extremes without truly investigating the ideal length of learning material. Just what is micro-learning, and how is it changing corporate learning initiatives? Microlearning is simply the idea that episodes of learning need to occur in small, digestible bits. A single piece of microlearning content, for example, might be a short video that’s just a few minutes long and contain a few key points or tips on a single topic. (Contrast that with traditional training, which often occurs in 45-minute lectures or marathon workshops.) Microlearning allows a continual stream of short, engaging learning opportunities that can compete with all the other distractions in our attention-strapped workplaces. Corporate training using such content is much more effective than traditional training methods. Still, even within the realm of microlearning content, there are distinctions. Before investing in any short-form content, it pays to know some of the research identifying ideal content length. Microlearning using short-form content is becoming increasingly popular, for good reasons, both in corporate training and in formal educational settings. Online instructors have found, however, that engagement does not correspond linearly with content length. Consider a study of online course viewing that came out of the University of Rochester a few years ago. 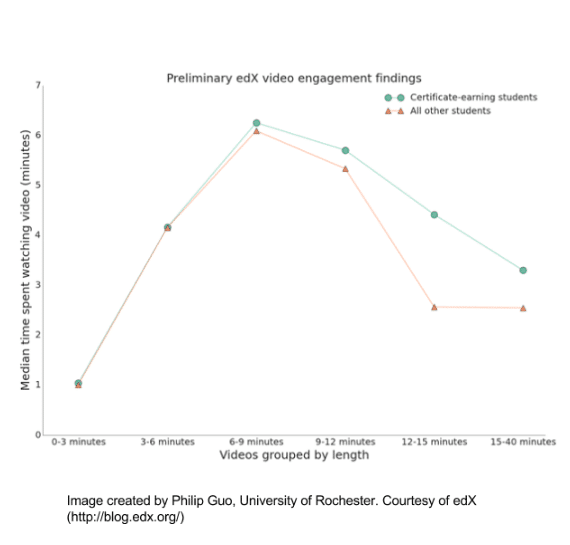 The study examined the average time students spent watching videos of various lengths for their online courses and found that students were watching most of the content in a video when its length was nine minutes or less. Thus, time spent watching increased linearly with video length up to that point, meaning that the effective content getting across to the viewer also increased. When videos ran over nine minutes, however, attention began to wander and students began skipping sections of the videos. This became noticeable for videos over 11 minutes long; for videos that were 15 to 40 minutes long, students were watching just under three minutes worth of material—less than 20 percent of the total content being presented! This data verifies that videos that are too long are less effective, where “long” is anything more than 15 minutes. They also fly in the face of the claim that “the shorter, the better,” as some eLearning gurus would have you believe. In essence, there is no gain in engagement or attention by making videos shorter than nine minutes. Videos, for example, in the 60 to 90-second range are consumed, but are so short that little content can be successfully conveyed. A stream of videos that are too short breaks continuity and limits many opportunities for engagement with the material. How Did We Come To Believe "Shortest" Meant "Best?" So where did the industry come up with the idea that a 60-to-90-second video would be a superior format for learning? This number is likely a range found in many informal studies of video length. Professionals have looked at the success of all kinds of video formats and lengths, including Super Bowl ads, crowd-funding videos, YouTube content, and more. Taking an average of the most successful ones (in terms of views, percentage of time played, likes, or similar metrics), one would find that videos in the 60-to-90s range did the best. But notice that the majority of these videos will be advertising and marketing pieces—particularly what we would call “disruption” advertising. These do best when they are entertaining and very, very short. Thus, the abundance of these videos skews the average. Filtering out advertisements and marketing pieces, and looking at more educational content only, one gets a different picture. The average successful podcast, for example, is 22 minutes long. The average Ted Talk is 18 minutes long. And many successful webinars, video tutorials, and product tours run around 10 minutes long. This simply means that the ideal length of one’s video must be suited to the need and task at hand. If your plan is to make a funny advertisement or PSA, where the goal is merely to remind or raise awareness, a minute-long video would suffice. If, however, your goal is to engage the audience while maximizing information transfer, a 7-to-9-minute video makes more sense. In summary, microlearning is a trend worth pursuing, but it will only be successful when it can convey an amount of content that can comfortably be absorbed by the viewer. For educational and training contexts, that limit seems to be with the 7-to-9-minute range. That’s why we’ve done our best to keep our videos in this range: to be efficient, but also effective. Sign up for a trial of Thinkzoom to see for yourself!